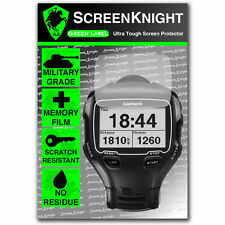 Screenknight GARMIN FORERUNNER 910XT SMART WATCH FRONT SCREEN PROTECTOR. ScreenKnight utilizes advanced technology originally developed by the Air Force to protect helicopter propeller blades. ScreenKnight proudly designs and manufactures high quality, scratch resistant screen protectors in the United Kingdom. Para Garmin Forerunner 910XT. Protectores diseñados con material Flexible Anti-Impacto y que resisten fuertes golpes, absorbiendo la mayoría del impacto, pasando a la pantalla una fuerza mínima, protegiéndola de roturas. 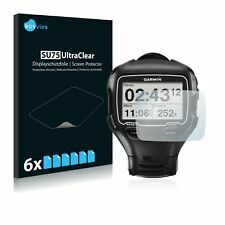 6x Savvies® SU75 Protector de Pantalla para Garmin Forerunner 910XT. Savvies UltraClear Protector Pantalla para Garmin Forerunner 910XT: Alta transparencia, protección contra arañazos, fáciles de montar. Para Garmin Forerunner 910XT. Su composición obtiene como características principales la dureza 9H del cristal templado convencional, y la flexibilidad y absorción a los golpes del material anti-impacto, entre otras muchas como la capa oleofóbica, agradable tacto, funcionalidad. 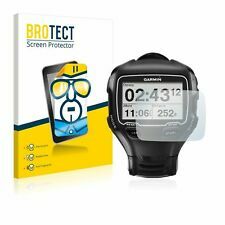 BROTECT® AirGlass® Protector Pantalla de Cristal Vidrio para Garmin Forerunner 910XT. BROTECT® AirGlass®, el Protector de Pantalla de Cristal Vidrio Premium: el colega Extra-Duro y Ultra-Ligero para tu Garmin Forerunner 910XT! 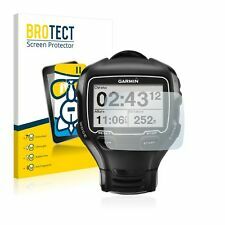 2x BROTECT® HD-Clear Protector de pantalla para Garmin Forerunner 910XT. 2x BROTECT® HD-Clear Protector de pantalla para Garmin Forerunner 910XT (2x Pantalla). Los arañazos lo tienen muy difícil con este Protector de Pantalla. 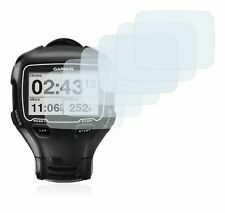 18x Savvies® SU75 Protector de Pantalla para Garmin Forerunner 910XT. Savvies UltraClear Protector Pantalla para Garmin Forerunner 910XT: Alta transparencia, protección contra arañazos, fáciles de montar. 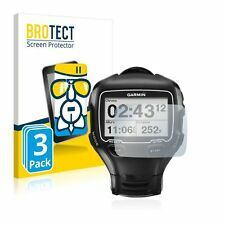 3x BROTECT® AirGlass® Protector Pantalla de Cristal Vidrio para Garmin Forerunner 910XT. BROTECT® AirGlass®, el Protector de Pantalla de Cristal Vidrio Premium: el colega Extra-Duro y Ultra-Ligero para tu Garmin Forerunner 910XT! 2x BROTECT® Matte Protector de Pantalla para Garmin Forerunner 910XT. Una capa adhesiva recién desarrollada permite un fácil montaje del. Una instalación sin burbujas y sin problemas. ¡Te vas a sorprender! BROTECT® AirGlass® Glass Screen Protector for Garmin Forerunner 910XT. BROTECT® AirGlass® Premium Glass Screen Protector, the Extra-Hard and Ultra-Light sidekick for your Garmin Forerunner 910XT! Product Video BROTECT® AirGlass® Premium Glass Screen Protector - YouTube. Garmin Forerunner 910XT, 2x BROTECT® Matte Screen Protector. Product Video BROTECT® AirGlass® Premium Glass Screen:-. BROTECT® Matte Screen Protector for Garmin Forerunner 910XT - Matte and anti-glare, anti-scratch, anti-fingerprint, easy to apply and residue-free removable. Product Video BROTECT® AirGlass® Premium Glass Screen:-. 3 x BROTECT® AirGlass® Premium Glass Screen Protector, the Extra-Hard and Ultra-Light sidekick for your Garmin Forerunner 910XT ! BROTECT® AirGlass® Premium Glass Screen Protector for Garmin Forerunner 910XT (3 x Display). Garmin Forerunner 910XT, 2x BROTECT® HD-Clear Screen Protector Crystal-clear. Product Video BROTECT® AirGlass® Premium Glass Screen:-. BROTECT® HD-Clear Screen Protector for Garmin Forerunner 910XT - Crystal-clear, hard-coated, anti-fingerprint, easily mountable and removable. Garmin Forerunner 910XT BROTECT® AirGlass® Premium Glass Screen Protector Clear. Product Video BROTECT® AirGlass® Premium Glass Screen:-. BROTECT® AirGlass® Premium Glass Screen Protector, the Extra-Hard and Ultra-Light sidekick for your Garmin Forerunner 910XT ! High transparency Protection against scratches Easy to assemble Unbeatable value for money Produced in German. Attach screen protectors without bubbles of air -. TM protection can outlast your device. Its tactile strength is unmatched. This is why it is the best possible protection for your phone. However it is quite simple! Anyone can do it. TM is Designed and Laser Precision Pre-Cut to give your entire screen maximum protection while improving grip, with no cutting necessary. 3x BROTECT® AirGlass® Glass Screen Protector for Garmin Forerunner 910XT. BROTECT® AirGlass® Premium Glass Screen Protector, the Extra-Hard and Ultra-Light sidekick for your Garmin Forerunner 910XT! Product Video BROTECT® AirGlass® Premium Glass Screen Protector - YouTube. 2x BROTECT® HD-Clear Screen Protector for Garmin Forerunner 910XT. BROTECT® HD-Clear Screen Protector for Garmin Forerunner 910XT- Crystal-clear, hard-coated, anti-fingerprint, easily mountable and removable. 6x Savvies® SU75 Screen Protector for Garmin Forerunner 910XT. Savvies UltraClear Screen Protector for Garmin Forerunner 910XT: Crystal-Clear, easy application, excellent price quality ratio. The Savvies® SU75 UltraClear screen protectors are manufactured in Germany with the latest high-precision laser machinery. 18x Savvies® SU75 Screen Protector for Garmin Forerunner 910XT. Savvies UltraClear Screen Protector for Garmin Forerunner 910XT: Crystal-Clear, easy application, excellent price quality ratio. The Savvies® SU75 UltraClear screen protectors are manufactured in Germany with the latest high-precision laser machinery. 2x BROTECT® Matte Screen Protector for Garmin Forerunner 910XT. BROTECT® Matte Screen Protector for Garmin Forerunner 910XT- Matte and anti-glare, anti-scratch, anti-fingerprint, easy to apply and residue-free removable. Vikuiti™ screen protector CV8 for Garmin Forerunner 910XT: Ultra clear and highly adhesive, hard-coated, residue-free removal. The film surface can easily be cleaned in most cases with a dry cloth. Marker pen ink can be simply removed. ILLumiShield Ultra Clear HD Screen Protector for Garmin Forerunner 910XT. Screen protectors should be subtle. iLLumiShieldis 100% confident that our Ultra Clear HD screen protectors provide crystal clear clarity while protecting your screens from scuffs and scratches. ILLumiShield is 100% confident that our Matte Anti-Glare Garmin Forerunner 910XT screen protectors will aid in the reduction of glare and harsh reflected light while protecting your screens from scuffs and scratches. EZguardz are Thin and Clear. You Receive (2) EZguardz Protectors With Full Instructions. Using a Credit Card push out air bubbles and press the protector onto your phone. Clean your screen. Made From a Scratch Resistant Material with a Slightly Grippy Feel. EZguardz are Thin and Clear. You Receive (4) EZguardz Protectors With Full Instructions. Using a Credit Card push out air bubbles and press the protector onto your phone. Clean your screen. Made From a Scratch Resistant Material with a Slightly Grippy Feel. EZguardz are Thin and Clear. You Receive (3) EZguardz Protectors With Full Instructions. Using a Credit Card push out air bubbles and press the protector onto your phone. Clean your screen. Made From a Scratch Resistant Material with a Slightly Grippy Feel. EZguardz are Thin and Clear. You Receive (1) EZguardz Protectors With Full Instructions. Using a Credit Card push out air bubbles and press the protector onto your phone. Clean your screen. PRE-CUT and Designed For Your Specific Phone and READY to Use! EZguardz are Thin and Clear. You Receive (6) EZguardz Protectors With Full Instructions. Using a Credit Card push out air bubbles and press the protector onto your phone. Clean your screen. Made From a Scratch Resistant Material with a Slightly Grippy Feel.